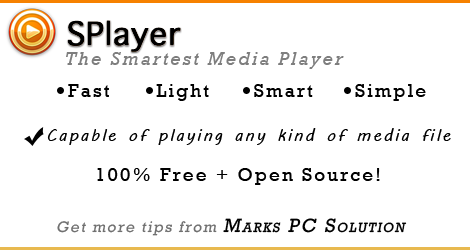 SPlayer is a really fast and smart media player for any format. Starting from 3GP to MKV, SPlayer is my first choice. It can play any video or audio file. It's start up time is super fast. And the control is very easy. You can operate this better than any other media player. My visitors often ask me for a good media player. They ask which one is best, or which is capable of running with minimum configuration. And my answer is always same - SPlayer! Download SPlayer 3.7 from this link. It's less than 8 MB. You can also try the Portable Version. Now install SPlayer on your system. It takes less than 20 MB hard disk space. And it's compatible with any running version of Windows. After completing the installation, you will get the icon on Desktop or Start Menu. It's really easy to operate. There is no confusing control. To play a video, Run SPlayer > then click on Open File > Locate and select your desired file. You can also play a video by directly clicking on it. But if that file format is not selected by SPlayer by default, then you must right click on file and choose SPlayer as default media player for that format. You have two bars in the screen. One is at the top which allows you to control screen size, brightness & contrast etc. And the other is at the bottom which allows you to play/ pause, open files, show play list, control volume etc. You can get these bars simply by moving your mouse pointer. You can download subtitle by right click on the player. Right click on it > Choose Subtitle > Select your subtitle if any > If not available then choose Smart Subtitle Matching > Select Smart Subtitle Finder > Subtitles will be downloaded automatically if available. Press Space to play or pause the song/ movie. Or simply click by mouse. Press Ctrl+T to keep the player on top. Press again to exit on top mode. Press Up/Down Arrow to increase or decrease volume. You can also use Mouse Scroll Button to control the volume. Press Left/Right Arrow to move forward or backward. But if you need to move more, then use Ctrl + Left Arrow/ Right Arrow. You can also use the progress bar and use your mouse to navigate. Press C to adjust the video size. There are many other shortcuts. But these are not essential for a basic user. I'm not gonna discourage you to explore more from SPlayer. Hope you will enjoy this player. I'll take note about this.